A team of Rice University students accepted a challenge to turn shale gas produced in China into a range of useful, profitable and environmentally friendly products and did so in a cost-effective manner. The CHBE Pandas (CHBE stands for chemical and biomolecular engineering) designed a process by which shale gas extracted in the rich Sichuan Basin could be turned into methanol, hydrogen and carbon disulfide, all valuable products in the booming Chinese economy. The Rice team was one of seven groups of students presented similar challenges for locations outside of the United States as their capstone design projects, required of most graduates of Rice’s George R. Brown School of Engineering. For their efforts, the Pandas – Apoorv Bhargava, Prachi Bhawalkar, Valicia Miller, Shelby Reinhardt, Kavita Venkateswar and Erte Xi – were grand prize winners at the Engineering Design Showcase, part of Rice’s UnConvention earlier this month. The team had to deal not only with processing what’s known as “sour gas” straight out of the wellhead, but also had to come up with a solid budget for the construction and profitable operation of the plant as well as a strategy to protect the environment. “We think it’s a viable project because of what we’re transforming the natural gas into,” Venkateswar said. The process they designed would take in the raw shale gas produced in the controversial extraction process known as hydraulic fracturing, or fracking. The primary product would be methanol, of which China is the largest user in the world. China blends methanol into gasoline and is developing cars that would run on pure methanol. The second product, hydrogen, would be a feedstock for ammonia in fertilizer production, which has great value in the Sichuan Basin, the largest agricultural area in China. The third would be carbon disulfide, widely used in the Sichuan textile industry. The team said 99 percent of the recovered fracturing fluid would be purified into water and fed into methanol production. A small amount of crystallized sludge from fracturing chemicals would be sent to a landfill. Team advisers Kenneth Cox and Richard Strait were inspired to issue the assignment by a Department of Energy-funded 2011 study on shale gas and U.S. national security by Rice’s Baker Institute for Public Policy. The report details the rapid development over the last decade of technology to extract natural gas from shale, an increasingly rich resource in the United States, and the resulting shift in the world’s energy economy. “The world of shale gas presents a real interesting situation,” said Strait, an adjunct professor of chemical and biomolecular engineering at Rice and former director of coal monetization and CO2 management at KBR. “We’re in boom times – if you want to produce gas at what are now historically low prices. You make no profit.” He said energy producers are considering ways to turn raw shale gas into products that will better serve the market’s needs. “The ability to make carbon disulfide provides us a solution to the high hydrogen sulfide content,” Xi said. A team of Rice University senior engineering students won Top Design Team, along with several other awards, at this year’s Texas Space Grant Consortium (TSGC) competition with a proposal for an emergency eyewash system for astronauts. From left, Team Helios members Zachary Foster, Rob Bauer, Thierry Rignol, Malcolm Blake and Eric Lee. In addition to the grand prize, Team Helios was honored for Best Test Procedure and Documentation, Best Poster and Model Presentation and Best Oral Presentation. The team tied for first for Forum Favorite and took home a total of $1,850 in prize money. Helios was one of 11 teams competing in the annual NASA-sponsored event, which included competitors from Texas A&M, Texas Tech and the University of Texas. Team members are Rob Bauer, Malcolm Blake, Eric Lee and Thierry Rignol, all bioengineering majors, and Zachary Foster, a mechanical engineering major. Their advisers are Matthew Wettergreen, a lecturer in bioengineering, and Brent Houchens, an assistant professor of mechanical engineering and materials science. The eyewash goggles designed by Team Helios are designed to work in zero gravity. The goal of the senior capstone design project was to create a set of goggles that would allow spacefarers to both wash their eyes in an emergency while containing and eliminating excess fluids. The team’s solution involved borrowing suction from a space toilet to help contain the rinse water. “The comments from the judges were that this was very high-quality work, and everyone was very impressed,” Wettergreen said. “The device is successful based on the original constraints set by NASA, and with a few cosmetic modifications and superficial fixes, it could perform like a professional eyewash station. Last year, two Rice teams undefined the Electric Owls and CardiOwls undefined shared the grand prize. OEDK director wins national award! The American Society for Engineering Education (ASEE) has honored Maria Oden, professor in the practice of engineering education and director of the Oshman Engineering Design Kitchen (OEDK), with its prestigious 2012 Fred Merryfield Design Award. Oden joined the Department of Bioengineering at Rice as a lecturer and laboratory coordinator in 2004; she guides the technical design efforts of undergraduates participating in Beyond Traditional Borders and the Rice 360˚: Institute for Global Health Technologies. Oden has mentored more than 160 students in 43 design teams in the two-semester bioengineering capstone design course sequence that she developed and taught. Oden earned her Bachelor of Science in engineering and master’s and Ph.D. in biomedical engineering from Tulane University in 1989, 1991 and 1994, respectively, and worked as a postdoctoral fellow at Harvard Medical School from 1994 to 1997. She also worked in orthopedic biomechanics and computational modeling as a senior research associate at Beth Israel Deaconess Medical Center. In 2008, Oden became the inaugural director of the OEDK, where she has inspired hundreds of students to work in teams of four or five to complete design challenge projects. More than 15 teams have won regional and national awards at design competitions. Several of their devices are being tested in the United States and abroad, and 15 students have graduated with patent applications on their resumes. The Fred Merryfield Design Award is presented annually in recognition of “creativity and demonstrated excellence in the teaching of engineering design.” It comes with a $2,500 honorarium, a $500 stipend for travel to the ASEE annual conference and a commemorative plaque. Oden’s department will also be given an award of $500. Oden will receive her award June 13 at the 2012 ASEE Conference and Exposition in San Antonio. Another day, another four turns of the screw. That’s just a part of life for people, primarily children, undergoing the long and difficult process of distraction osteogenesis, a method to correct bone deformities that leave one limb shorter than the other. In collaboration with Shriners Hospital for Children in Houston, the students came up with “LinDi,” a self-adjusting, automated linear distractor. It eliminates manual manipulation of the screw with a motorized process that makes the gradual growth of new bone a more natural process. And for the first time in such a device, they have built in a force-feedback loop that protects fragile tissues and nerves from being overstressed. That’s inconvenient, even risky if a child or parent forgets to make the adjustment, said Rice mechanical engineering student Raquel Kahn. And wearing the bulky brace is no treat, either. Team members Kahn, Alvin Chou, Mario Gonzalez, Stephanie Herkes and Elaine Wong took LinDi on as their senior design capstone project at the behest of Gloria Gogola, an orthopedic hand and upper-extremity surgeon at Shriners who specializes in pediatrics. Working at Rice’s Oshman Engineering Design Kitchen (OEDK), the students had access to all the materials and expertise they needed to conceptualize, build and test a prototype even while completing their coursework. “We’re teaching students the importance of prototyping as early as possible,” said Marcia O’Malley, an associate professor of mechanical engineering and materials science and the team’s faculty adviser. “Even if it’s cardboard and tape, they’re able to visualize a project early in the process. “One of the big features of this project is the force sensor,” she said. “If the loads on the tissue are too high, the device shuts the motor off.” O’Malley said early tests with strain gauges paid off in the team’s level of confidence when the time came to build a working prototype. “The great thing about the OEDK is that everything is so accessible here. I could say, ‘Well, that team over there is working with strain gauges. Go talk to them and find out how they’re doing it,” she said. Current patients wear distractors for as long as it takes to complete the process, typically stretching a limb for two to four months, Kahn said. Then they leave the device on for six more weeks, like a cast, while the bone sets. Each of the Rice students wore a standard distractor (minus the bone-drilling part) for 24 hours to get a feel for what patients endure. “The hardest part was we kept banging into things,” Gonzalez said. Through Shriners, the team got the opportunity to perform short-term animal testing that “helped us work out some of the kinks we weren’t aware of in the device,” Herkes said. Rice University students have developed an inexpensive, battery-powered neonatal monitor for infants that could save many lives in the developing world. The undergraduate team “CHBE Pandas” became the first team of chemical engineering seniors to win the grand prize in the Brown School of Engineering Design Showcase and Poster Competition, a featured event of this week’s UnConvention at Rice April 12-14. The team took the $5,000 Excellence in Engineering Design prize, one of 15 awards given at the April 12 showcase at Rice’s Tudor Fieldhouse. The name “CHBE Pandas” is a riff on the common acronym undefined which is pronounced “chubby” undefined for the Department of Chemical and Biomolecular Engineering. The CHBE Pandas won for their design of a self-sufficient chemical plant to upgrade raw natural gas and clean water used in well fracturing. The goal is to improve the quality of life for people in the Sichuan Basin in China. Members of the CHBE Pandas celebrate their victory in the Brown School of Engineering Design Showcase and Poster Competition. Team members are Apoorv Bhargava, Prachi Bhawalkar, Valicia Miller, Shelby Reinhardt, Kavita Venkateswar and Erte Xi. The CHBE Pandas and many of the other showcase winners will display their work at theOshman Engineering Design Kitchen on Saturday from 1 to 4 p.m. during the UnConvention.  Best Interdisciplinary Design Project: tCOIL, a wireless system to power ventricular-assist devices.  Best Conceptual Design Project: TLDW Inc., a sustainable airport-themed diner.  Best Global Health Technologies Engineering Design Project: Team SAPHE, a postpartum hemorrhage warning system for the developing world.  Best Energy Related Engineering Design Project: Tanker, a wireless sensor-receiver to accurately and inexpensively measure the fluid level in above-ground oil storage tanks.  Best Health Related Engineering Design Project: CivSAFE, a replacement for cervical collars to protect the heads and necks of accident victims.  Best Environment and Sustainability Award: Team SONSO, which has designed an environmentally sound station to link Houston’s METRO Rail to Amtrak.  Best Sustainable Civil Design Project: CCP Civil Solutions, the design of a LEED-certified construction company headquarters.  Best Gaming, Creative or Innovative Technology Award: Team Cadet, a customizable accelerator-decelerator equipment tester for military use.  Best Engineering Design for Research: Team O3, a system for the ozone sterilization of bone grafts.  Best Engineering Design Project by Underclassmen: IV Ring, an IV drip volume regulator for the developing world.  National Instruments Award for Engineering Design: Don’t Believe the Pipe, a robot navigator to inspect complex pipeline networks.  Texas Instruments Award for Engineering Design: Mobile Vision, a novel system for eye health diagnostics.  Judges and Professors Choice Award: Rice Solar Car Club, the university’s first solar-powered car, which took second place in its division in the recent Shell Eco-marathon Americas.  Students Choice Award: Breath Alert, a neonatal apnea monitor for the developing world. Undergraduate students at Rice University have come up with what they hope will prove to be a better and safer version of cervical collars to stabilize the heads and necks of accident victims. Cervical collars have been in common use since their introduction during the Vietnam War. The Rice seniors known as Team CivSAFE took on the challenge of a Houston researcher, an expert in spine mechanics, to develop safe and effective cervical spine protection for trauma victims. The team of three mechanical engineering and three bioengineering students responded to the challenge with a prototype that immobilizes the head without putting pressure on the neck. Kelsey Horter, a bioengineering student and a certified emergency medical technician, said the students tested a cervical collar currently used and found that when a patient’s neck is injured, the collar can push the head away from the body. “That separates the vertebrae and can make neck injuries worse. Some physicians believe the current collar may have compounded injuries,” she said. “The collar was developed during the Vietnam War as a device that could be put on really quickly and would be easy to use,” said Rice senior Georgia Lagoudas. The disposable HeadCase is expected to cost less than the $15 price tag on current disposable collars, of which 15 million are used in the United States each year, the students said. “Mass production will drive down the cost,” said team member Oviea Akpotaire. A team of Rice University seniors developed the HeadCase, a cervical collar that properly immobilizes the head without putting pressure on the neck. From left: Oviea Akpotaire, Kelsey Horter, Michael Zylberman, Elias Hoban, Georgia Lagoudas and Sailesh Prabhu. The HeadCase stores flat for easy transport and can be placed on a patient in 60 seconds, team members said. Inspiration for the device came from John Hipp, former director of the Spine Research Laboratory at Baylor College of Medicine (BCM) in Houston, who has long sought a replacement for standard cervical collars. A team led by Hipp published a study in the Journal of Trauma in 2010 showing abnormal separation between vertebrae due to cervical collars. He approached Maria Oden, a professor in the practice of engineering education and director of Rice’s Oshman Engineering Design Kitchen, about offering this challenge to engineering students, who are required to complete a senior capstone design project. All of the students on Team CivSAFE have spent time wearing both the original collar and their prototype, and found the new device to be much more comfortable. “We hope that will reduce the chance patients will have pressure sores,” said team member Elias Hoban. The team, which has filed a provisional patent through Rice, is testing student volunteers to develop statistics on just how immobilized a variety of patients wearing the HeadCase will be. Horter and Prabhu have volunteers bite down on a popsicle stick attached to an accelerometer, like those now commonly found in smartphones, to measure the range of motion they’re able to achieve both with the standard collar and the HeadCase in place. “One of the critical questions we’ve asked is, When a patient is turned on his side, will his head flop to the ground?” Hoban said. “We’ve found ours just does a better job” compared with standard collars, he said. Michael Zylberman, a mechanical engineering member of the team and an EMT with Rice’s Emergency Medical Services, has extensive experience with the use of standard collars over the past three years. “In the simplest terms, we think ours works better,” he said. The team will take its HeadCase prototype to IShow, a student engineering design competition to be held in Montreal in June. The high-profile competition is sponsored by ASME, formerly the American Society of Mechanical Engineers. Ten student teams, including CivSAFE, have been named finalists in the competition, two of them from Rice. CivSAFE’s device will be on display during Rice’s UnConvention, April 12-14, during which the public is invited to take part in a wide range of activities, including the 2012 Engineering Design Showcase at Tudor Fieldhouse April 12. A Rice University senior capstone project to help infants with sleep apnea took top honors in the second annual National Undergraduate Global Health Technologies Design Competition hosted by Rice 360°: Institute for Global Health Technologies and the Beyond Traditional Borders initiative. Other winning projects were a modular infant incubator (Columbia University) and ways to address respiratory disease (Marquette University) and a protein deficiency in malaria-prone regions (Johns Hopkins). Team Breath Alert members Jordan Schermerhorn, left, and Andrea Ulrich test the infant apnea monitor at the Oshman Engineering Design Kitchen. The team won the top prize at this year's National Undergraduate Global Health Technologies Design Competition. Eighty-four students from universities nationwide gathered at the BioScience Research Collaborative last Friday for the competition. Twenty-four teams from 15 universities, including three from Rice, presented their designs and delivered short oral presentations that defined a global health problem and described a technology they had designed to solve it. Teams also presented posters on their designs. Teams were judged on how well they articulated the global health challenges they sought to solve, the technical and social feasibility of their designs, their descriptions of the current status of their solutions and their plans to overcome remaining challenges. Judges included engineering and business faculty members from across the country, engineers from industry, physicians working in global health, technology transfer professionals and representatives from the U.S. Agency for International Development, NASA and Becton Dickinson. Student teams presented health technologies they had designed in response to a variety of global health challenges, including common causes of neonatal mortality, safe labor and delivery practices, fistulas, neglected tropical diseases and anemia.  Breath Alert from Rice University took first place for its Babalung Apnea Monitor, which alerts nurses when a baby is suffering from apnea. Team members were Jordan Schermerhorn, Rachel Alexander, Rachel Gilbert, Bridget Ugoh and Andrea Ulrich. They were advised by Rice faculty members Maria Oden, professor in the practice of engineering education, and Gary Woods, professor in the practice of computer technology.  Human Powered Nebulizer from Marquette University won second place for its hand-crank nebulizer to enable patients to inhale aerosolized medication for respiratory disease. Team members were Katelynn Kramer, Andrew Weingart, Sarah Schmeidel, Brian Laning, Ellie Hawkinson and Chris Hallberg. They were advised by Lars Olson, an associate professor of biomedical engineering at Marquette.  G6PDesign from Johns Hopkins University earned third-place honors for its point-of-care diagnostic device to detect G6PD deficiency, a condition common in malaria-prone regions. G6PDesign team members were Rohit Dasgupta, Vikram Rajan, Richard Powers, Uma Mohan, Joy Ukaigwe, Hannah Jiam, Ming Kang, Jordan Mandel, Renu Kondragunta and Pranay Rao. They were advised by Anne Le, assistant professor at The Johns Hopkins School of Medicine.  IncuVive from Columbia University won fourth place for its modular incubator system to combat infant hypothermia in low-resource settings. Advised by Aaron Kyle, a lecturer in biomedical engineering at Columbia, team members were Kiet Vo, Min Ye Shen, Annabelle Chu Yan Fui, Indrias Bekerie and Leeanna Hyacinth. In addition, three teams won People’s Choice Awards. A team from Johns Hopkins University won for its presentation on “Improving Neonatal Resuscitation in the Developing World.” Teams vPRIME from the University of Pennsylvania and IV Raid from Rice University won for their posters. After the presentations, Johns Hopkins faculty members Harshad Sanghvi of Jhpiego and Soumya Acharya of the Center for Bioengineering Innovation and Design delivered a keynote address on the potential of global health technologies to solve some of the world’s most critical global health challenges and promising new technologies in development. Rice solar car places second in Shell Eco-marathon! The Rice University Solar Car club charged out of the blocks and won second place in its first Shell Eco-marathon Americas over the weekend. Rice finished behind a team from Newburgh (N.Y.) Free Academy in the prototype solar category. The Rice Solar Car team brought its vehicle, RSC Enterprise, to the Shell Eco-marathon Americas for the first time this year. The team finished second in the prototype solar class. 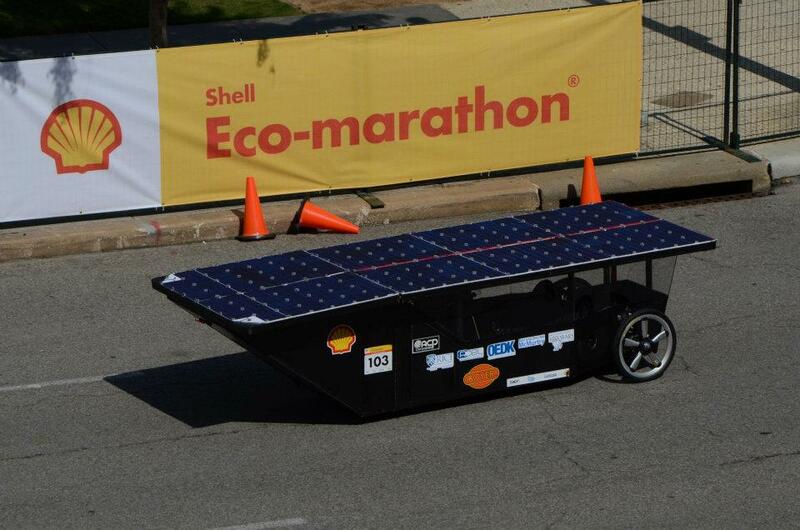 Rice Solar Car Team featured on the Shell website for their participation the EcoMarathon!